There’s a game I used to share in my conference-planning days because it could quickly unite a diverse group of people who didn’t yet know each other. Called “The West Wind Blows,” it has players sit in chairs arranged in a circle while one person in the middle calls out different sorts of descriptors such as “The West Wind blows on everybody wearing socks” or “The West Wind blows on everyone who’s ever gone skiing.” If the description applies to you, you stand up and scurry to another place in the circle. In order to be a good sport and keep things lively, you have to move out of the “safe” comfort zone of simply swapping places with someone next to you and strike out into the circle itself. If the chairs are all filled before you find a new one, you get the privilege of being the one in the middle trying to think up the next description until you’re able to rush to an empty seat again. At its best, this game keeps everyone moving around, often for quite some time, and just about all ages can play it together. Within minutes, this resource can weld a motley group of 50 adults and children into a bustling, giggling mass of happy humanity all focused on the same thing. It’s one of those opportunities that gives everyone permission to let down barriers to knowing each other when we’re sometimes not even sure why those barriers exist in the first place. As many games do, it also offers chances to model or reinforce positive kinds of behaviors. You have to cooperate and pay attention. You have to move skillfully and quickly while being considerate and careful of others’ movements. The variation and balance of similarities and differences is what seems key in this game, what keeps everyone attentive, and ensures that all will be included. Curiously, your best chance at getting out of the middle is to be as inclusive as possible. The greater the number of people you get up and moving, the greater your chances of finding a chair — and the more fun everyone has. You might say that inclusiveness is the game’s objective, and the way you reach it is by focusing on how much more similar we are than different. A coming together of the world’s peoples in a relationship as harmonious, open, and welcoming as a good game of The West Wind Blows is clearly a need of our times, if a far more complex prospect. There seems little doubt that creating such a universal culture of collaboration and conciliation will require great, persevering effort on our part, as well as creativity, and compassion. The job is big, the tasks complex, and many of the elements quite daunting. But the promise is big, and the reward unprecedented, if we can find the wisdom and will to truly embrace the diversity with which the Creator has gifted us and let it be the path to unity it’s intended it to be. No matter what kinds of winds may blow on us, or how hard, it does appear that we’ll benefit far more by facing them together. Categories: Creativity and spirit, On the heart's path, Sustainable Future, The divine in the details, World citizenship | Tags: Bahá'u'lláh, change, collaboration, cooperation, Creativity, Eric Hoffer, fellowship, friendliness, harmony, learning, Life at First Sight: Finding the Divine in the Details, Love, oneness of humanity, unity | Permalink. Shall we come to our spiritual senses? In this world we possess both outer and inner senses. The first helps us to navigate in the world, while our inner senses enable us to connect with our soul’s highest purpose and manifest it. In the next world, the equivalent of our inner, spiritual senses are the attributes of God. Such divine qualities as love, justice, mercy, and patience become our eyes and ears, so to speak. If we only developed the many facets of these attributes during what we define as our happy times in this life, we would be unable to fully discern the world beyond, because we would not have fully developed our spiritual senses enough to be aware of all that that reality includes. The times that we characterize as difficult in this life are named so because they usually go against the grain of our desires. Yet those desires are often defined by our human nature, which bases its assessments on past experience. Even in this world, there is so much more that we can know, but it requires being willing to go beyond the perceived limits of our past experience. One of the spiritual attributes of God, also a name of God, is the Creator. As with all attributes of God that we have been asked to acquire, this one has facets of both giving and receiving. Thus, a wide variety of experience — including the painful and difficult — offers the contrast that helps us build our capacities for both giving and receiving. This is indispensable if we are to fully develop any attribute, particularly the attribute of creativity. Unless we adopt an unlimited belief in our ability to create, we will never know what we are capable of creating. Cultivating an unlimited faith in the rightness of every one of our experiences to bring exactly what’s needed for the very highest possibilities in our development and that of other souls is a wonderfully effective way of “coming to our spiritual senses”. 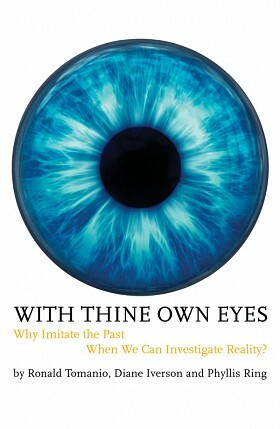 Co-authors Ron Tomanio, Diane Iverson, and Phyllis Ring explore related themes in With Thine Own Eyes: Why Imitate the Past When We Can Investigate Reality? from George Ronald Publisher. Categories: Creativity and spirit, On the heart's path, With Thine Own Eyes | Tags: adversity, belief, building capacity, Creativity, experience, faith, giving, perceived limits, receiving, senses, spiritual attributes, the role of contrast, Vision | Permalink. New Hampshire author and librarian Linda Tiernan Kepner shared words about my novel, The Munich Girl, that strike a grateful chord in me. That is the reason that I write, from the stubborn belief that this is the sort of world that all of our hearts want, and that those hearts long, innately, to help bring it into being. Because that is what they are created for. “All of the particles of the world are in love and looking for lovers,” Rumi wrote. I read recently that much of what is expressed out into our world aims at a lowest common denominator. But have we not a highest common one? A kind and willing servant of Love? What sort of love letter to the world can be written for — and from — this treasure? How can each and every one of us value, protect, and manifest it, like infinite candles, brighter than any darkness, whether imagined or real? Categories: Creativity and spirit, On the heart's path, Snow Fence Road, Sustainable Future, The divine in the details, The Munich girl - A novel, This writer's path, World citizenship | Tags: beauty, goodness, highst common denominator, Kahlil Gibran, kindness, Light in darkness, Linda Tiernan Kepner, Love, Mother Teresa, Ralph Waldo Emerson, Rumi | Permalink.